Growth Retardation (GR) is one of the main features in Down syndrome (Jones, 1988) and becomes manifest from the age of 6 months, when growth hormone (GH) usually starts acting (Anneren, 1990). Growth hormone controls the production of Insulin-like Growth Factors (IgFs), of which two main forms have been identified in human plasma: the active form (SmC/IgF-1) and the neutral form (IgF-2). These IgFs are bound to specific proteins in blood and no free forms are known. They stabilise the serum concentration and delay the half-life of somatomedins. IgF-1 has a molecular weight of 7649 daltons and is encoded by a single gene localised in the long arm of chromosome 12. The IgF binding protein complex can be separated after acid treatment (Furlanetto, RW 1977). IgF-1 levels are influenced by age and diet. They are low in children with protein malnutrition, hypothyroidism, coeliac disease and anorexia nervosa (Unterman, 1985). Depressed IgF-1 concentrations have been found in cirrhosis of the liver and other hepato-cellular diseases. In patients with end-stage renal failure, serum somatomedin concentrations have been reported as low, normal or elevated, depending on the assay technique used (Takano, 1979). Sara found that while foetal somatomedins, determined by radio-immune assay (RIA), were scarcely detectable in the first Down syndrome foetus examined a significant amount was observed in the youngest age group examined (Sara, 1981). This increase remained constant throught life (Sara, 1983). Normal brain receptors for Insulin, IgF-1 and IgF-2 have been found in foetuses with Down syndrome (Sara, 1984). Anneren et al (1990) found normal values of RIA IgF-2, but low levels of RIA IgF-1, and they hypothesised a delay in maturation and incomplete switching from the foetal to the GH-dependent form of IgF-1. Barreca et al measured IgF-1 plasma levels in 39 children affected by Down syndrome, and found a positive correlation with age. In Down syndrome obesity is frequent (Cronk, 1985), probably due to eating behavior disorders and/or reduced physical activity. The aim of this study was to detect the IgF-1 plasma levels in subjects with Down syndrome, and to determine whether there is a correlation with age and BMI. One hundred and thirteen subjects with Down syndrome (68 males and 45 females, aged 1-23.66 years and 1-23.8 years respectively), followed routinely at the Oasi Institute, were submitted to IgF-1 plasma assay. Body weight was measured on standard scales and height was measured using a Harpenden stadiometer. Pubertal stage was recorded, using Tanner's method. There was no evidence of severe congenital malformations, malnutrition, coeliac disease, or alterations of thyroid or adrenal function. None of the patients were taking any medication which might have influenced the study. Blood samples were collected in test-tubes containing EDTA, and were immediately separated and frozen at -20º C until assay time. Body Mass Index (BMI) was also calculated, (body weight divided by height squared (Kg/m2)). IgF-1 radio-immuno assay (RIA) was performed (Nichols Institute diagnostic kit, san Juan Capistrano, USA). Plasma samples were matched beforehand with an ethanol-chloridric acid mix (ratio 87.5% ethanol 12.5% chloridric acid). The supernatant was neutralized by adding 0.855 M Tris-base, and was transferred into test-tubes containing 1.4 ml of buffer solution. Final dilution was 1:225. IgF-1 standards, obtained with DNA-recombinant techniques, were necessary to produce a standard curve. This was calibrated against the WHO 1st International Reference Reagent 1998, Insulin-like Growth Factor-1 87/518. Values were expressed in ng/ml. The curve ranged from 0.3 to 4.9 ng/ml. The sensitivity of levels was calculated to 0.06 ng/ml. The IgF-1 antiserum does not show cross-reactivity with other peptide hormones. This study was approved by the Ethical Committee of Oasi Institute. Informed consent was obtained from the parents of all the subjects enrolled. Multiple regression analysis was utilized to correlate IgF-1 with age, and BMI. IgF-1 plasma levels were assayed for each pubertal stage in people with Down syndrome. Table 1 shows the standard deviation and the mean of IgF-1 levels, age and BMI in Down syndrome males and females respectively. Table 2 shows the multiple regression analysis of IgF-1 levels against age, and IgF-1 levels against BMI in the two groups. The two groups show a significant positive correlation of IgF-1 levels with age. However, no correlation was found between IgF-1 levels and BMI. We have confirmed a positive correlation between IgF-1 levels and age (Barreca, 1994). We believe that early reports (Anneren et al, 1990) suggesting an IgF-1 selective deficiency in Down syndrome similar to that in Pygmies must have been based on a different methodology. The BMI figures were significantly higher in Down syndrome compared with normal subjects, and this is further evidence suggesting higher levels of obesity in this group (Cronck et al, 1985). No correlation between IgF-1 and BMI was found. 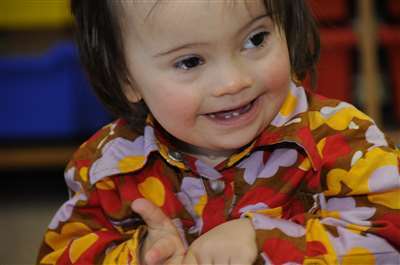 It follows that BMI remains a reliable tool for the diagnosis of overweight and/or obesity in Down syndrome. The same, however, cannot be said for IgF-1 levels, because, as shown above, they do not correlate with BMI. Anneren G., Gustavson, K.H., Sara, V.R., & Tuvemo, T. (1990). Growth Retardation in Down Syndrome in Relation to Insulin-Like Growth Factors and Growth Hormone. American Journal of Medical Genetics Supplement, 7, 59-62. Barreca, A., Rasore Quartino, A., Acutis, M.S., Ponzani, P., Damonte, G., Miani, E., Balestra, V., Gordano, G., & Minuto, F. (1994). Assessment of Growth Hormone Insulin Like Growth Factor-1 axis in Down's Syndrome. Journal of Endocrinological Investigation, 17, 6, 431-436. Cento, R.M., Ragusa, L., Proto, C., Alberti, A., Romano, C., Boemi, G., Colabucci, F., & Lanzone, A. (1996). Basal body temperature curves and endocrine pattern of menstrual cycles in Down syndrome. Gynecological Endocrinology, 10, 133-137. Cronk, C. E., Clumlea, W. C., & Roche, A.F. (1985). Assessment of overweight in children with trisomy 21. American Journal of Mental Deficiency, 89, 433-436. Daughaday, W.H., Mariz, I.K, & Blenthen, S.L. (1980). Inibition of bound somatomedin to membrane receptor and immunobinding sites a comparison of radioreceptor and radioimmunoassay of somatomedin in native and acid-ethanol extracted. Journal of Clinical Endocrinology and Metabolism, 51, 781-788. Giannella-Neto, D., Cavaliero, A.M., Sadoyama, R., Wajchenberg, B.L., & Spencer, E.M. (1990). Evaluation of a radioimmunoassay for Somatomedin-C/Insulin-like growth factor I (Sm-C/IGF-1) in Human plasma. Clinica Chimica Acta, 188, 253-260. Sara, V.R., Gustavson, K.H., Anneren, G, Hall, K., & Wetterberg, L. (1983). Somatomedins in Down's syndrome. Biol Psychiatry, 18, 803-811. Unterman, T.G., Vasquez, R.M., Slas, A.J., Martyn, P.A., & Philips, L.S., (1985). Nutrition and somatomedins. XIII. Usefulness of Somatomedin-C in nutrional assessment. A.M.J. Med, 78, 228-234.